Not your ordinary tacos – these Thai chicken lettuce tacos are spicy and exotic, made with my light peanut sauce which I make with PB2 (powdered peanut butter) sriracha, ginger and spices. 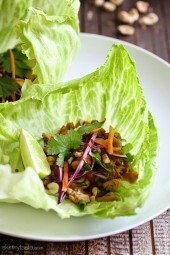 To balance out the spice, I chose to serve these in crisp cool lettuce wraps but tortillas would work great too! Replacing tortillas for lettuce is a great way to make tacos even lighter or even gluten. A few more I love Steak Lettuce Taco Wrap, Turkey Santa Fe lettuce Wraps, and Laotian Chicken and Shrimp Larb. A few months ago while visiting Asheville, NC with my friend Sandy (such a great food scene there!) we stopped for lunch at the White Duck Taco Shop, a creative taco joint where we had Bulgogi Tacos, Bangkok Shrimp Tacos and Duck with Mole Tacos. What do food bloggers talk about while eating lunch together? Well we talked about food, recipes ideas, and decided we were going to come up with our own creative taco recipes and share them together. Well it took longer than we hoped, but finally today we are both sharing our fun unique spin tacos. Check out Sandy from The Reluctant Entertainer’s Black Bean Tacos with Roasted Salsa recipe here. 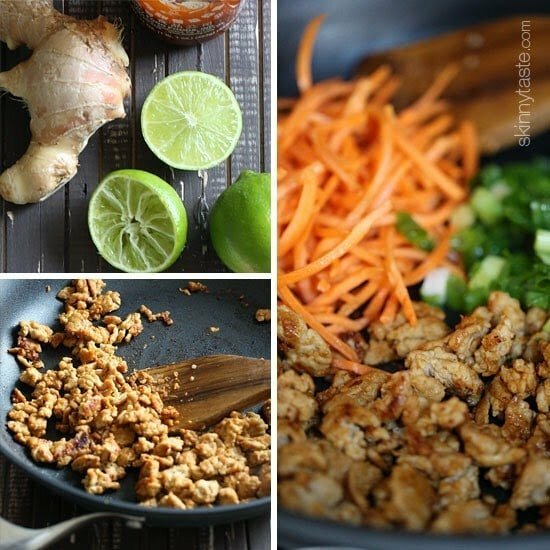 And if you’re in the mood for Thai without the guilt, you’ll love these spicy peanut chicken lettuce tacos! Enjoy and happy Taco Tuesday! Add the shredded carrots, and 1/2 cup of the scallions and sauté until tender crisp, about 1-2 minutes. Set aside. I added red pepper flakes to the sauce to make it hotter, and served on chopped lettuce (instead of taco style), was great. I would make this as a salad again and add fried wontons on top to add more crunch. Delicious!! Ate it without the additional toppings and didn’t even miss them! Delicious! I doubled the recipe so my family could have leftovers and everyone loved it! Perfect for dinner or as a lunch. Wow! One of my favorite for sure! Splurged with real peanut butter and it was so delicious! We love this recipe!!! My daughter could eat this every day! and with the low calorie count, that wouldn’t be a problem 😉 The only thing I did a little different, was adding some soy sauce or some of the peanut sauce to the chicken while cooking because it seemed to be too dry. This is very good and so easy! This recipe is delicious!!! Thank you Gina! Awesome recipe! Had this printed out for a while and we finally got around to making it. This was so easy, so quick and so good. Even the cleanup was minimal! Another great one by Gina! This was awesome! Even my picky husband said, “wow!” I loved the spicy and sweet combo. It definitely satisfied our Thai craving! Amazing! I used ground turkey because I had it on hand, but otherwise followed the recipe exactly. I loved it. My 9 yr old enjoyed the flavor, even helped me cook, but it was a bit too spicy for her. Good thing we served it with sliced cucumbers as suggested in the recent meal plan! WINNER WINNER CHICKEN DINNER!! SO GOOD. MY 12 YR OLD PUT THE SAUCE TOGETHER WHILE I PREPPED THE CHICKEN AND THE WHOLE MEAL CAME TOGETHER SO EASILY. DELICIOUS! This recipe is fantastic!! My husband and I went on our honeymoon to Thailand a few months ago and I felt like I was right back there eating this!! Thank you!! Huge hit! Even my super picky bf loved them and had 2nds. Kids enjoyed as well, not too spicy for them. Delicious. Will make again. Making these tonight…very excited! So glad you got to experience White Duck. Love those tacos. Native Ashevillian here ? I just entered the ingredients into the WW recipe builder and I calculated a serving at 2 points. Any idea why? This was delicious! A little spicy for my children, but thank goodness they didn’t eat it because Mom and Dad were fighting over the last one! I used chopped chicken thighs instead of ground chicken. I made this last night and it was amazing! My man is still raving about the peanut sauce. I will definitely be making this often! I made this tonight and I was so pleased! So tasty and satisfying. I didn’t add the peanuts because I forgot , but I did add a little fish sauce and fresh basil along with the cilantro. I served it with seasoned black beans cooked with a tea spoon of coconut oil – delish!! So delicious. But I’m not clear on how your calculating the free style points. I’m getting 13 for the entire dish. The only ingredients that I see that have points are the peanut butter, the honey and the chopped peanuts. Please tell me where I’m figuring wrong. Most ground chicken at the store has dark meat included which has points. Search ground chicken in the tracker. But if you know it’s ground chicken breast then that may change the calculation. Didn’t tell my family I used PB2 and no one was the wiser. Really delicious. This was a delicious recipe. I will definitely make this again and again. Thanks for sharing. Wonderful! My husband thought these were the best chicken lettuce wraps he’s had. Used real peanut butter and didn’t have sriracha so substituted harissa in the sauce and lemongrass paste in the chicken mixture. Otherwise stuck to the recipe. So delicious and another thing I loved was that I’m usually obsessed with having things piping hot but I just put the meat mix in a serving bowl then used the same skillet to do a veggie stir fry. Bottom line lots of prep but relatively little clean up and a great healthy meal. Gina, Gina, Gina! You have done it again! We loved these! They are so beautiful too, with the colors! I couldn’t find the PB2, so used regular peanut butter. I’ll keep searching for the PB2 because these are definitely going into the Taco Tuesday rotation! Thanks Gina! Hi Gina! Would this work with ground venison? I have a lot of venison I need to use and was looking for a healthy thai lettuce wrap. My husband and I LOVE your cookbooks and all your recipes so thank you! Loved this, the sauce is to die for! I didn’t have fresh ginger, so used powdered, broccoli stem instead of cabbage and I used ground pork instead of chicken. A winner for sure! Will definitely add to the rotation of regulars. Do you know what the Saturated Fat is on this? Making these tonight and SO excited! 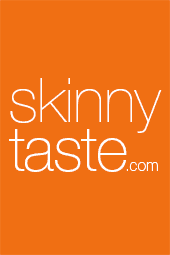 I just put it into the recipe builder on Weight Watchers and got a different SP value. Did you use ground chicken or ground chicken breast? I don’t like spicy food what can I use in place of sriracha sauce?? 1 – I will have to try these. They look totally delish! 2 – I’m totally having White Duck for dinner tonight. I’m on my to Asheville for work. Thanks for mentioning it… yum! Super delicious. One of the best things I’ve made in ages. I made these tonight for the first time and they were amazing!! it’s easily one of my 3 favorite meals from this site!!! Made these for dinner tonight using ground chicken breast (personal taste preference), and they were so good! Cannot wait to eat the leftovers for lunch tomorrow. I will definitely be making these again! These rocked! My mom showed me your website, and everything so far has been delicious, but these taco’s were fantastic! I already had chicken breasts on hand, so I just minced them as best as I could and it turned out great. The lime as the topper really freshened everything up, and tamed the siracha! (I used more than the recipe) A+ from me! We made this tonight and it was fantastic! We used broccoli slaw in place of the cabbage and carrots – mixing in with the chicken to cook and then served it on a mixture of raw broccoli slaw and shredded lettuce. Will definitely make again! We loved this! Even my junk food junkie teenager said, “This is so weird. It should taste this good.” I especially appreciate being able to toy with the “heat”. I’m not a fan of spicy, but the rest of my family goes overboard. The peanut sauce made it easy to satisfy everyone. We added brown rice in our wrap/taco. Just made this for dinner tonight and they were the best lettuce wraps I’ve ever had. Thanks for sharing! 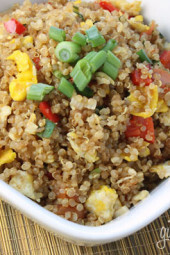 I tried this tonight with shredded instead of ground chicken since that’s what I had. I was afraid it wouldn’t work (I looked in vain for comments, hoping someone else had tried it first!) but surprisingly it did – I just needed to add 1/2 cup of chicken broth to get all the other flavors to mix in. Very good, thank you! This looks amazing! I have a peanut allergy, do you think I can use almond butter? I am not worried about the taste, more so the consistency? Would you recommend 3 TBSP still? I wonder how firm tofu to substitute ground chicken would taste like? Does anyone know how long to cook in slow cooker? I think these flavors infused in slow cooking would be great. Thank you so much for another ah-mazing recipe. I made these tonight exactly per the instructions and we devoured them. Another keeper!!! I have made this probably 10 times 🙂 I love it and so does my fiancé (and he's kinda picky when it comes to meals that aren't steak or seafood). The sauce is killer, so I double the recipe so I have plenty for leftovers or to dip veggies in or whatever! AMAZING! This was a huge hit at dinner tonight! It is powdered peanut butter. You can find it in most supermarkets. Can I just leave out the sriracha sauce w/o it affecting the dish too much? Also, the recipe says "chicken and noodles" but I don't see noodles on the ingredient list or anywhere else? I ended up using the peanut sauce and the cabbage to make a coleslaw and topping it with the cooked chicken. It came out delicious and easy to pack in my lunch! Just made these for dinner tonight and they were delicious!! Easy too. I currently have a cast on one hand, so my husband's doing most of the cooking. He was a little tired tonight and didn't want to cook, but I persuaded him to help me make these and he was so glad he did. You're the best, Gina! 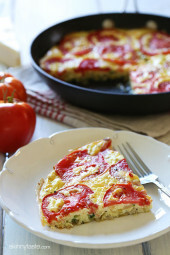 This is definitely on my dinner menu this week! I may add some lemongrass and lime leaves. Do you have a substitute for the PB? Have a peanut allergy in my house, but would love to make these! So good! My boyfriend and I love to make these. My boyfriend made these tacos for a healthy food recipe competition at work and these tacos won! Thank you so much! Delicious! We'll be making this again soon! This was amazing! I made mine as a salad instead of wrapping it in a lettuce leaf and added some mandarin oranges on top for some added sweetness. Ground poultry typically gives me the heebie jeebies, but I went out on a limb and was pleasantly surprised. Once the meat was loaded up with all the toppings and the peanut sauce and siracha I couldn't even tell I was eating ground chicken. My kids ate everything without complaint and even my husband admitted it was really good. *He shares my ground poultry aversion and cursed when he originally saw the package of ground chicken come in the door. Great recipe. Thanks Gina! Agree about the ground chicken…but the peanut sauce, the seasonings and all the veggies transformed a bland food into a grand dish. Since I used half the honey called for in the sauce, I added some shredded fresh apple to boost the sweet flavor and fiber of the chicken. Stir fried it with the veggies. Eating a bowl right now and savoring every bite! That peanut sauce rules. Doubled it to have enough to toss on otherwise simple salads or zip up roast chicken. Thanks Gina! This looks really good! In the recipe you say for the chicken and the noodles, what noodles are you talking about? Made this tonight with my best friend! We used Frank's instead of siracha… It was delicious!!! I had some extra baked chicken breasts that I cut up in cubes tossed in the sauce. I added the veggies and this was a great low carb dinner! Great recipe (as usual)! These look amazing. I'm adding it to my Real Food Meal Plan next week! I'm thinking the peanut sauce is making this more flavorful. Ah! The sweet and exciting tastes of Thai dishes. I fell in love with their dishes when I visited their country. Other than it's tasty, it's healthy too. They may have added more sugar or honey to their recipes, I know it can't do good to my healthy (read it from this article from iwbodywraps.com by the way), but so far, i even lost one size in a couple of months. Thanks for sharing this recipe. I was planning on making baked Thai egg rolls on Monday night with a curried cauliflower soup, so finding a skinny taste filling for the wonton wrappers is awesome! I know the wrapper will add a few more calories than just lettuce, but I live overseas and lettuce is not always available and/or trustworthy! Wonderful recipe! Made it for dinner last night and both my husband and I absolutely loved it. Thanks for a different sort of taco Tuesday! How was the White Duck Taco Shop? Did you eat anywhere else in Asheville to make note of? I live about 1 1/2 hours from there and am planning to go soon! Hmm…I've been wanting to make something like this. Perfect timing! I'm going with real PB though…dont have the powdered. It's been so long since I've made a lettuce wrap. This one is right up my alley. Looks wonderful! I love options like this for 'low carb' meals! Delicious. I'd love to make these for appetizers, too! So fun to post our taco recipes today, Gina! Hugs! My boyfriend can't have Siracha because all the brands. Can find contain sulfites. Do you think gochujang sauce would work instead? It's a sweet spicy Korean red pepper sauce. 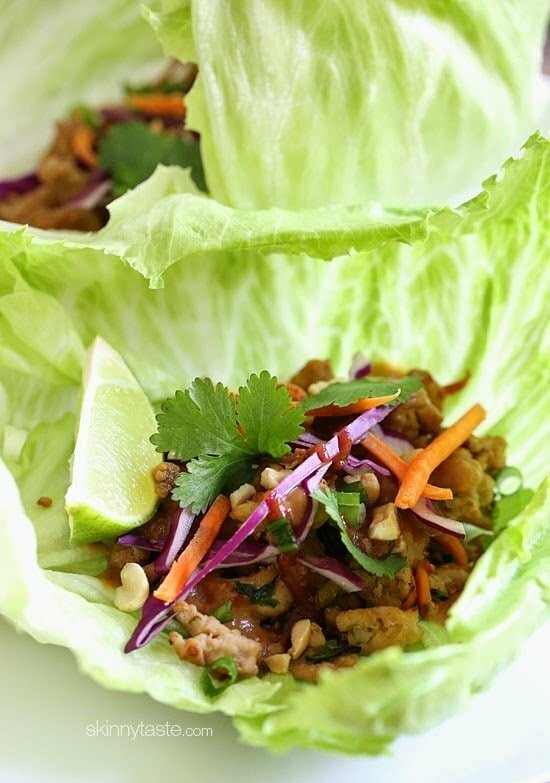 I love using lettuce cups and feel that pork always goes so well with it too! 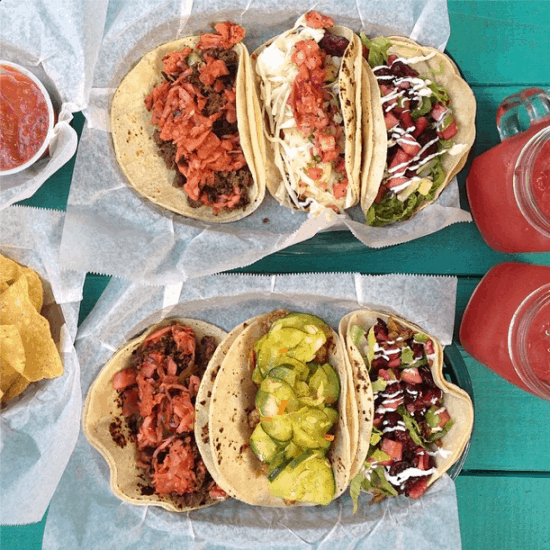 Definitely adding these to our Taco Tuesday rotation!! That peanut sauce is sooo creative with the PB2! Are the points plus the same whether you use PB2 or peanut butter? Thanks! This looks and sounds amazing, deffo putting on my list! Great Low Carb Dinner! Ill have to forego the soy sauce, but other than that this looks great!